He was pleased with victory in the opening game, but head coach Daryl Powell reckons Castleford Tigers will have to improve to back it up with a second win at Hull tonight. 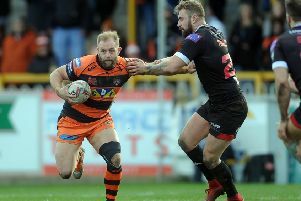 More of the same defensively is the order of the day after the Tigers conceded just one try in their first Betfred Super League outing of 2019, but they will have to be better with the ball to challenge the Black and Whites according to Powell. He said: “We’re going to need to be patient. I think Hull are defending well, they take a bit of breaking down so you need to show a lot of patience and durability across the game. “We did that well last week, but I think we’re going to get challenged a bit more this week. “I think the conditions will be pretty firm. It’s going to be a big challenge for us and I think we’re going to need to improve. “It’s a big field and they are playing expansively so your one-on-one defence on the edges needs to be really good. “Our pack was fantastic last week and will need to be so again. Matongo and Taylor are starting, they are big humans to deal with then Paea comes off the bench and he’s a handful as well. Hull may have lost their opening game against their city rivals, but Powell is wary of the threat they pose, particularly on their own turf at the KCOM Stadium. He said: “They played well last week, it was just a good game. “Hull KR defended really well. Hull are moving the ball a bit more than they did last year, particularly in yardage areas. “I thought they really challenged Hull KR and they lost at the death so it’s ridiculous Radders (Lee Radford) is under pressure. He has done a great job there. “Particularly the back end of last year the amount of injuries they had, they’ve had a tough period. This will be a tough game for us. “They look like they are well motivated this season. You’re always looking at the way a team’s organised, how well motivated they are. They are all characteristics that a coach brings to a team and they look in good shape. “They have got some good players and had to play with one half last week, effectively, so that was tough for them. “Connor is coming back in and he’s a tricky player, a self-styled bad boy he likes to get under people’s skin so that’s always interesting. He is a real quality player and they’ve got good players across the field. Castleford’s side will show two changes from the team that beat Catalans with Mike McMeeken ruled out after concussion forced him off the field last week and Matt Cook picking up a hamstring injury. Tuoyo Egodo and Jacques O’Neill have been drafted into the 19-man squad, but Mitch Clark and Ben Roberts are more likely to be on the bench after being left out last week. Powell explained: “We’ve lost Mike McMeeken. He came off with a head knock and Matt Cook probably won’t play. There’s a couple of changes in there, but we’re not far off. I thought Alex Foster did a great job in the back-row when he came on for Mike so he will take that role again.